You have two right triangles that are similar. The base of the first is 6 and the height is 9. 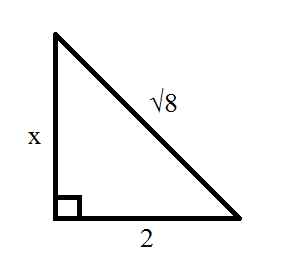 If the base of the second triangle is 20, what is the height of the second triangle? In the figure above, line segments DC and AB are parallel. What is the perimeter of quadrilateral ABCD? Because DC and AB are parallel, this means that angles CDB and ABD are equal. When two parallel lines are cut by a transversal line, alternate interior angles (such as CDB and ABD) are congruent. Now, we can show that triangles ABD and BDC are similar. Both ABD and BDC are right triangles. This means that they have one angle that is the same—their right angle. Also, we just established that angles CDB and ABD are congruent. By the angle-angle similarity theorem, if two triangles have two angles that are congruent, they are similar. Thus triangles ABD and BDC are similar triangles. We can use the similarity between triangles ABD and BDC to find the lengths of BC and CD. The length of BC is proportional to the length of AD, and the length of CD is proportional to the length of DB, because these sides correspond. The length of BD is 25. We now have what we need to find the perimeter of the quadrilateral. Perimeter = sum of the lengths of AB, BC, CD, and DA. A right triangle is defined by the points (1, 1), (1, 5), and (4, 1). The triangle's sides are enlarged by a factor of 3 to form a new triangle. What is the area of the new triangle? 32 x 6 = 9 x 6 = 54 square units (since the units are not given in the original problem). NOTE: For a volume problem: Vnew = (SF)3 x (Vold). Solve for (rounded to the nearest tenth). Figure not drawn to scale. We will use the Pythagorean Theorem to solve for the missing side length. A square boxing ring has a perimeter of feet. When the two boxers are sitting in opposite corners between rounds, how far apart are they? Since the perimeter of the ring is feet and the ring is a square, solve for the length of a single side of the ring by dividing by . The distance between the two boxers in opposing corners is a straight line from any one corner to the other. That straight line forms the hypotenuse of a right triangle whose other two sides are each feet long (since they are each the sides of the square). 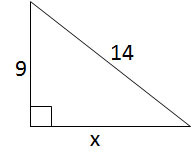 Solving for the length of the hypotenuse of this right triangle with the pythagorean theorem provides the distance between the two boxers when they are in opposite corners. Given a right triangle with a leg length of 6 and a hypotenuse length of 10, find the length of the other leg, x. Also note that this is proportionally a 3/4/5 right triangle, which is very common. Always look out for a side-to-hypoteneuse ratio of 3/5 or 4/5, or a side-to-side ratio of 3/4, in any right triangle, so that you may solve such triangles rapidly. In a right triangle a hypotenuse has a length of 8 and leg has a length of 7. What is the length of the third side to the nearest tenth? Given a right triangle with a leg length of 2 and a hypotenuse length of √8, find the length of the other leg, x. The legs of a right triangle are and . Rounded to the nearest whole number, what is the length of the hypotenuse? Use the Pythagorean Theorem. The sum of both legs squared equals the hypotenuse squared. (Figure not drawn to scale). Use the Pythagorean theorem: . We know the length of one side and the hypotenuse. Now we can solve for the missing side. Pennsylvania State University-Main Campus, Bachelors, Spanish. Pittsburgh University, Masters, Masters of Social Work. University of Colorado Boulder, Bachelor in Arts, Mathematics.